Together you have decided to begin a lifetime journey of love. We at Immaculate Conception and St. Joseph Parish rejoice with you, your family and your friends on your decision to be married. The Church recognizes your marriage as a sacrament, meaning that your visible love and faithfulness to each other will become a powerful sign of God’s love. It is a sacred celebration meant to express your faith in God and your love for each other. Our prayers and best wishes are with you on this journey! Looking for a wedding date? Please tell us a little bit about yourself and your fiancé by completing our Couple’s Information Form. Our event coordinator, Allie Salamone, will then get back to you with more information. Once you have confirmed your wedding date with Allie and our pastor, Father Larry Lisowski, you can secure the date by making your non-refundable $500 deposit at our Wedding Deposit page. In order to ensure that the musical portion of your marriage preparation experience is personal, thoughtful, and one that brings you closer together as a couple, our Director of Music will have you and your fiancé complete our Wedding Music Planner. This planner will assist you in choosing the instrumentalists, vocalists, and music for each part of your wedding. We encourage couples to attend a few Masses with us at 11:00 a.m. on Sunday to hear Father Larry Lisowski’s homily (check our current bulletin for his schedule); listen to our Director of Music, Kate Ryan, sing; and meet our sacristan, Toni Gamble. In the meantime, you may view the St. Joseph Church floorplan to see how our church is set up. Important, please download and save these documents to your computer before printing them. Do I need to be a registered member of Immaculate Conception and St. Joseph Parish to be married? No, you do not need to be a registered member of the parish, but we do ask that our couples are actively involved in a parish. 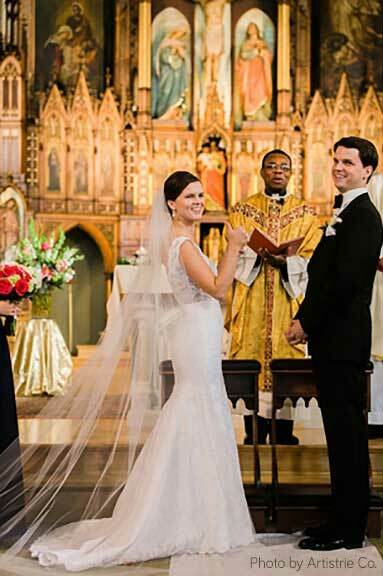 Being married in the Catholic Church is a sacred bond, one that should not be taken lightly. Celebrating your faith weekly helps strengthen and grow relationships before and during marriage. What qualifies someone as an active parishioner? An active parishioner is someone who is known to us and Father Lisowski and are seen in the pews on a regular basis. They give back either monetarily or be serving in one of our ministry opportunities. 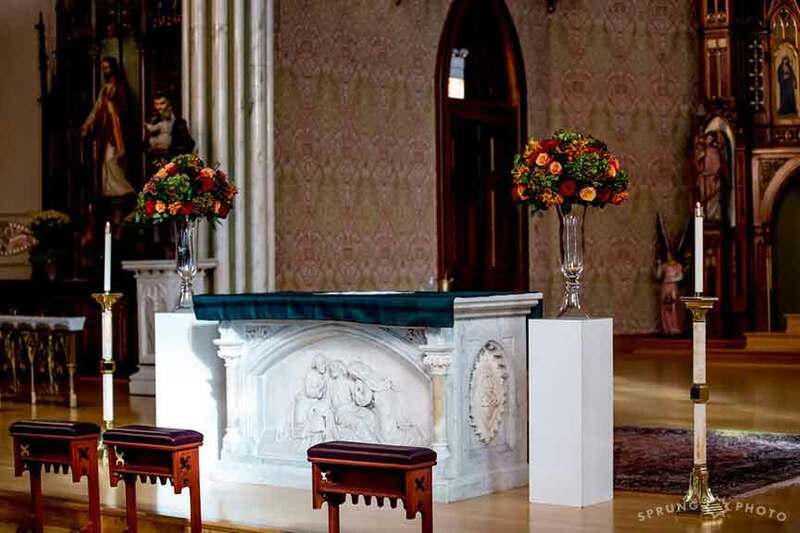 What are the wedding fees for ICSJ Parish? St. Joseph Church was built in 1878 and has been through many renovations and updates. The fees paid by wedding couples not only go to the helping the couples prepare for their wedding day, but also goes toward the maintenance and upkeep of our beautiful building. How far in advance should I schedule my wedding day? At least six months in advance of your requested wedding date. Can we have our own priest preside at our ceremony? ICSJ Parish welcomes all members of the clergy who are in good standing with the Catholic Church to celebrate a wedding in our parish. No extra fee is required for this, but we do ask that they complete the Visiting Clergy Agreement. Yes, guests needing assistance can enter through the Parish Center doors located at sidewalk level. From there, there is a ramp available for entrance into the church. Handicap stalls are available in both washrooms and a single washroom available for those who need assistance. Does ICSJ have a room for the bridal party before the ceremony? For the ladies we have a bridal room located just inside our Parish Center doors. The room comfortably seats 6–8 people and has easy access to the women’s multi-stall washroom. For the gentlemen, we have our conference room located inside the Parish Center offices; this room will seat up to 10 people comfortably. A single-person washroom is located next to the conference room for the men to use if they wish to avoid the atrium where guests may gather. If the bride and groom are not seeing each other beforehand, the rooms are separated enough that with help of the bridal party one will not see the other. Can we do marriage prep with ICSJ if we are getting married in another state/parish? Yes, our pastor is happy to meet with couples to help with preparing for their wedding day. We will provide you will paperwork preparation and the Foccus Inventory. While we do not have a fee for this service, we do ask that our marriage prep couples make a donation to the parish. When do we begin our Music Planning? All music planning will be coordinated with our Director of Music, Kate Ryan. She will contact you via email approximately 8–10 weeks prior to your wedding date to begin the process. If we want to use our own musicians and not ICSJ’s, is there a fee? Yes, a $150 fee would apply. Our Director of Music is contracted to play all of our wedding ceremonies. Music coordinating with the couples is part of her salary requirement. Can we hire additional musicians to play our wedding? Yes, our Director of Music is well-connected with other talented musicians in the area who are familiar with playing in our church. These additional musicians are considered vendors being hired by the couple and will need to be paid directly by you. Fees should be coordinated directly with the musicians. Is the church temperature controlled? Yes, our church has full working AC in the summer months and heat during winter months. Our parish center is also equipment with AC and heat. How long do we have to use the church? 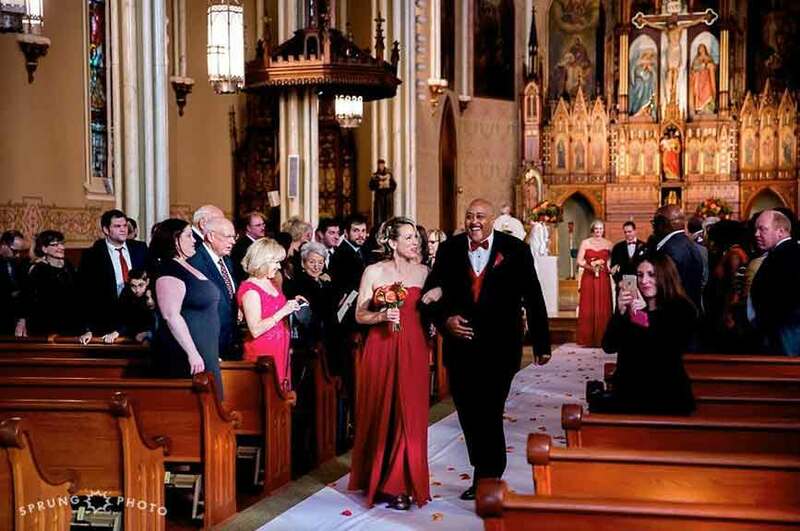 Each couple is given a two-hour window for using the church: 30 minutes prior to your ceremony start time for the bridal party and guests to arrive, a 60 minute ceremony, and 30 minutes following the ceremony for pictures. For ceremonies lasting longer than 60 minutes, photography time may be cut down. Can guests leave cars in the parking lot following the ceremony? Unfortunately, no. Another wedding may follow yours or another event may be scheduled at the school/church which requires the use of all the spaces. Cars left overnight are subjected to being towed at the expense of the owner. 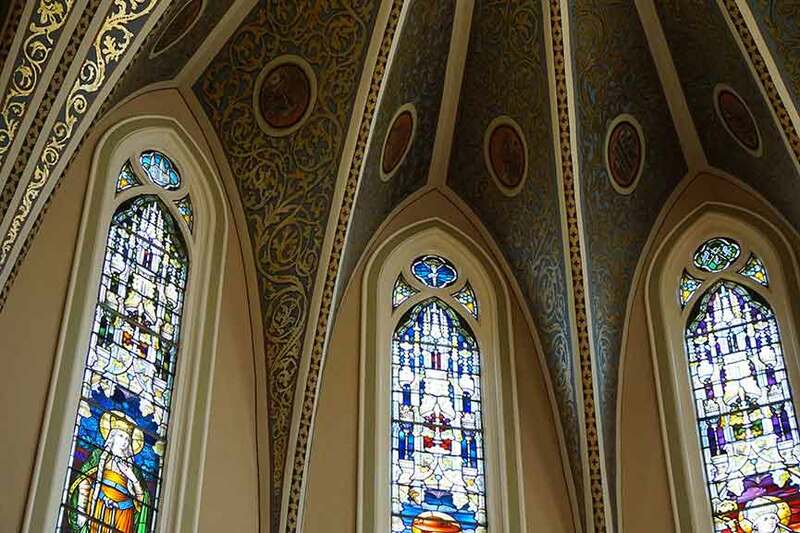 Immaculate Conception and St. Joseph Parish is a Catholic faith community blessed with two inspiring worship sites. 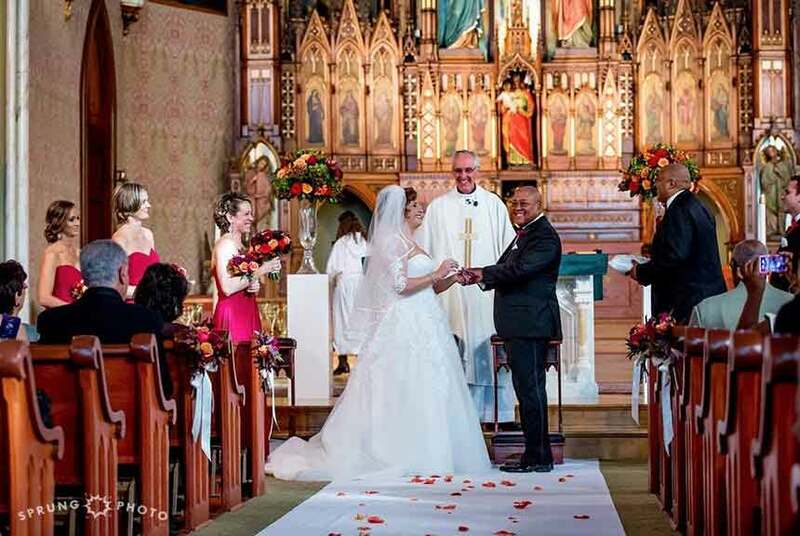 Our historic and diverse parish is located near downtown Chicago, in the Old Town neighborhood, making it a popular Chicago wedding ceremony site. 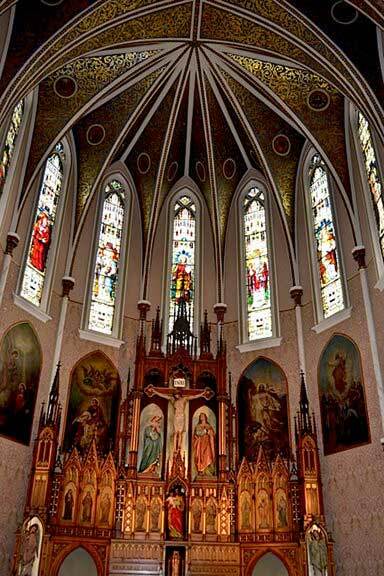 Most of our weddings are celebrated at St. Joseph Church, while Immaculate Conception Church is available for vow renewals (view map). ICSJ Parish was recently recognized by Wedding Wire for our commitment to ensuring a wonderful wedding experience for every couple. The award is determined solely based on reviews from real newlyweds and their experiences working with us.